The science of weight loss is complicated and imperfect. How are you supposed to know what to do? Or, maybe you have lost weight, only to gain it back. The pounds that crept back might have brought friends with them, leaving you heavier than you were before you went on a diet. Despite your efforts, it is likely that the only thing that is shrinking is your bank account: Americans spend an estimated$2.5 billion on weight loss programs annually. To remedy this, you try out some of the latest diets, in hopes that one of them will be the charm. But not only do you fail to lose weight, you often end up weighing MORE after you give up on the diet du jour…and you fall for the claims the next fad diet promises. These mistakes aren’t only costing you time and money – they may also be damaging your health and robbing you of your happiness. By now, you are probably wondering what you have been doing wrong. It isn’t your fault: there’s a lot of terrible information out there. Some advice is outdated, some is overly complicated, and some is just downright outrageous (tapeworm diets, balloons that inflate in your stomach to make you feel full, and the “cotton ball diet” are just a few examples – yes, those are all actual “diet plans” – and are really dangerous!). Here are 15 weight loss myths that are keeping you overweight. Myth: The scale is an accurate measure of progress/weighing yourself every day helps you control your weight. Truth: The scale only tells you your overall body weight – and there are many components involved there. Your body is composed of two kinds of mass – lean mass (bone, water, muscle, and tissues) and fat mass (the squishy stuff). For a more in-depth explanation on this, please see Why You Should Ditch Your Scale. Myth: The BMI (Body Mass Index) is a useful tool to determine if you are underweight, normal weight, overweight, or obese. Truth: The BMI is a simple height-to-weight ratio, and does not take into consideration one’s body composition. Athletes and bodybuilders with low body fat often are labeled as overweight or even obese on the BMI scale because they carry a lot of muscle. For more on BMI and why it is flawed, please see Scrap the Scale, Banish BMI: This Number Is Far More Important and BMI Is Broken: System Mislabels 54 Million as Unhealthy. 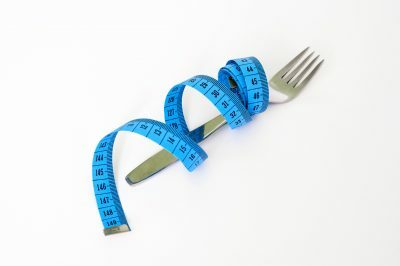 Myth: You should lose at least two pounds per week while dieting. Truth: One to two pounds of FAT loss per week is a general recommendation and is reasonable. But, for some people, the loss will be a bit higher, and for some it will be a bit lower – even for people following the same fat loss program. A larger person with more fat to lose will generally lose fat faster than a person who has less to lose, generally speaking. There are other factors that impact fat loss as well, including exercise, hormones, age, and overall health. Measuring body composition (how much body fat and lean mass you have) and taking your measurements are far better ways to track your progress than simply weighing yourself on a scale. Myth: You need to eat less to lose more weight. Truth: A common misconception about weight loss is “eat less, lose faster.” This belief might lead you to make drastic (and potentially dangerous) changes in your diet…changes that can actually backfire and sabotage your weight loss efforts. For a detailed explanation on why this happens, please see Diet Anarchy: Are You Eating Enough? Truth: There isn’t much research that supports the idea that eating frequent small meals is beneficial for weight loss or curbing hunger. In fact, some research shows the opposite: frequent eating may lead to MORE cravings and hunger. In fact, a pattern of eating called intermittent fasting – eating your day’s worth of calories during a specific period of time every day – is growing in popularity, and research supports its effectiveness for fat loss. There are several ways to do intermittent fasting (IF), including eating your calories from noon to 8 pm, fasting for 24 hours once or twice per week, or eating significantly less calories one or two days per week. Myth: You have to eat breakfast every day. Truth: For some people, eating breakfast is energizing and stops them from getting so ravenous they binge in the early afternoon. But, some prefer to put off their first meal until later in the day. If you enjoy breakfast, by all means, continue having it – but if you don’t, rest assured, your metabolism isn’t going to “crash” if you skip eating first thing in the morning. Listen to your body. If you aren’t hungry in the morning, there’s no reason to force yourself to eat. Myth: Eating too late at night will make you gain weight. Truth: Sure, if you eat a box of donuts or an entire bag of chips before you go to bed, that might slow down your progress…but what matters is how much you consume overall, and the quality of that food. Eating a salad or some nuts will affect your body differently than eating sugary junk food. Myth: You can eat whatever you want – just exercise more to burn it off. Truth: You can’t outrun a bad diet! Exercise (especially weight training) certainly can help you lose body fat, but you’d have to run for an hour to burn off a cupcake or walk five miles to burn off a 20-ounce bottle of soda. A healthy physique is made in the kitchen. There’s a reason that fitness and weight loss pros often say that 90% of attaining your ideal body weight is diet. Myth: You need to do a lot of cardiovascular (aerobic) exercise to lose weight. Truth: While aerobic exercise does aid in weight loss and weight maintenance, you don’t have to do excessive amounts to see benefits. A balanced fitness routine that includes aerobic exercise (examples: walking, running, biking) and weight training is ideal for most people. In fact, if you HAD to choose one kind of exercise for weight loss, weight training is the way to go – you’ll get far more bang for your buck. Myth: Lifting weights will make me bulk up and gain weight. Truth: First, let’s first debunk the myth that a pound of muscle weighs more than a pound of fat. A pound is a pound is a pound – whether it’s made up of muscle or fat. That said, muscle is more dense than fat and takes up less room, so two people who weigh the same can look much different if one has a higher ratio of lean muscle mass to fat. To see what different body fat levels look like, please see the charts in this article: Why You Should Ditch Your Scale. Muscle weight is a good weight to have because it helps you look firmer and more fit. It’s also more metabolically active, so having more muscle can boost your metabolism and help you stay lean. Myth: Eating healthfully is too expensive. Truth: While it is true that healthy food can be expensive, consider the long-term costs of the alternative. Also, there are ways to eat healthfully on a budget: plan your meals (this prevents you from over-buying and wasting food), cook at home (preparing large portions and eating the leftovers helps too), buy frozen fruits and vegetables, buy in bulk, grow your own vegetables, check out local farmers’ markets, use coupons, and watch for sales. Drinking water instead of sodas and juices is far healthier and can also add up to significant savings. If you’d like to save money (25-50% off) on healthy food and supplements – delivered right to your doorstep! – check out Thrive Market. Myth: Too much protein is bad for health. Truth: Common myths about high protein intake persist, despite the fact that there really isn’t any evidence to support them. Protein does not “leach” calcium from your bones and cause osteoporosis, and it does not cause kidney damage (UNLESS you have existing kidney disease – in that case, please ask your physician for guidance). In fact, proteins are building blocks for your body – every living cell uses them for structural and functional purposes. Muscle maintenance (remember – having a good amount of muscle makes losing fat easier) requires adequate protein in your diet. This protein calculator will help calculate your needs. For a list of protein sources and portion sizes (in ounces or cups and grams), please see Diet Anarchy: Are You Eating Enough? Myth: All calories are equal, so it doesn’t matter WHAT you eat, just how MUCH you eat. Truth: Let’s say you determine that, in order to lose 2 lbs of body fat per week, you need to consume around 1800 calories a day. Do you think that getting those calories from nutrient-rich, whole foods will give you the same results as getting those calories from candy bars, sodas, and fast food? Which kind of foods do you think will give you more energy, a better physique, and contribute more to your overall health? And, a HUGE recent study found that people eating high quantities of carbohydrates had a nearly 30% higher risk of dying during the study than people eating a low-carb diet. And, people eating high-fat diets had a 23% lower chance of dying during the study’s seven years of follow-up compared to people who ate less fat. In 2008, the results of a year-long randomized clinical trial known as the A TO Z weight loss study were published. The researchers found that in each diet group, the subjects who actually adhered to their diet lost the most weight. Hence, their conclusion: maybe adherence to a diet is more important than the actual nutrient composition of the diet. The trial is famous, at least, in the low-carb world, because the Atkins diet resulted in twice the weight loss of any of the three other diets tested, and it also did a better job of improving heart disease risk factors. When comparing the “similar” weight loss results of low-fat and low-carb diets, Taubes reminds us that there is a significant difference to these kinds of diets that matters – a lot: the low-fat diet was also low in calories – and the low carb diet (the Atkins diet) was NOT calorie-restricted. …if weight loss is the same in both groups, doesn’t this suggest, at least, that weight loss can be independent of whether dieters semi-starve themselves or eat to satiety? And, if so, of course, wouldn’t you rather get to eat to satiety? And, here’s another point to consider: low-fat diets that also cut significant calories will cut carbohydrates significantly as well, and often by more than they cut fat. So, even when following a low-fat diet, calories from carbs will be reduced significantly even though that isn’t the direct intention. Foods that cause the most weight-related troubles – bread, pasta, sugary foods, desserts, and sodas – will be dramatically reduced in low-fat diets. The “calories in/calories out” theory (obesity is simply a matter of eating too much) grossly oversimplifies the science of weight loss, which actually involves a complex range of processes that include the involvement of hormones (insulin is a particularly important one due to its role in fat metabolism), metabolic pathways, food quality, digestion, gut health, and psychology, among others. Dr. Jason Fung explains the impacts of insulin – and the other factors that influence weight gain and loss – in his remarkable book The Obesity Code (I highly recommend this one!). Calories DO matter, but where they come from matters more in terms of satiety, overall health, and body composition. What you eat (along with other factors, like your genetic makeup, of course) impacts how your body partitions and stores fat. Energy density (calories) of food does matter, for sure, but what matters much more is what that food does in and to our bodies. Will the calories we consume create an environment in our bodies where we want to consume more energy than we expend? Will the calories we consume create an environment in which our bodies prefer to store excess nutrients as fat rather than mobilize fat? These are the choices we make every time we put something in our mouth. All calories are not created equally. They do matter, but are less important than the metabolic effect of food on your body. For a much more detailed scientific explanation of this topic, please read Dr. Attia’s article Do Calories Matter? Myth: You must count calories to lose weight. Truth: Unfortunately, even with the best diet-tracking apps, people tend to greatly underestimate how much food they consume. Furthermore, calorie intake tends to fluctuate widely, with swings often exceeding 1,000 calories from one day to the next. Food labels pose another challenge: their calorie counts are not always correct, and digestion and food preparation methods alter how much energy we get from food anyway (for an in-depth and fascinating article on this, check out Science Reveals Why Calorie Counts Are All Wrong). Also, the calorie burning counters on exercise machines are usually WAY off, so don’t rely on them to tell you how much you are expending. A better – and MUCH easier – way to track your intake is to calculate your protein needs, and build your diet around that. After you calculate how many grams of protein you need each day, divide that number by how many times you will eat every day. For example, if you need 100 grams of protein per day and you want to have a protein-containing meal 3 times a day, you’ll need approximately 33 grams of protein per meal. Choose your protein source first, and add vegetables and healthy fats to round out your plate. Replacing sodas (yes, even diet sodas – they have been linked to increased risk of developing type 2 diabetes and abdominal fat gain) and sugary drinks with water is a simple yet very effective way to dramatically improve your diet and reduce your caloric intake as well. Myth: Juice cleanses and fasts can help you lose weight. Truth: Consuming nothing but juices from fruits and vegetables for a couple of days probably won’t do much harm to an otherwise healthy person. However, cleanses or fasts of longer duration can be detrimental for various reasons. Juices are high in sugar and very low in protein, which can lead to problems including unstable blood sugar (particularly in people who have diabetes), headaches, fatigue, stomach pain, and digestive issues. Any weight lost during a cleanse will be mostly (if not all) water weight, and will likely be gained back once you resume your normal eating habits. Join my online community here: Become a Patron!